In Michigan, 4/5 boats are gelcoat, and it is a fact that they will have a date with buffer coming up in the next year or so, whether a rough one, of just a smooth kiss and a light polish, something is coming. Having a coat of paint, especially a hard paint such as Awl-Grip, will keep the shine and protect the boat longer. However, even the toughest paint will get abused, especially in the hot sun and salt of the tropics. Buffing on paint requires slightly different techniques and slightly different products, but the science and the idea is the same. We are polishing the surface, and removing all surface contaminants. We are not grinding through the paint, or removing any of the surface. Just polishing. 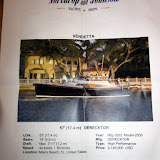 CASTLEFINN is a 112' Westport we did for the Westport display at the Palm Beach Show. Take a look between Jeff (Left) and Aidan (Right). Aidan's shadow is much more clear than Jeff's. That will give you an idea of how much more shine we had after buffing by Aidan. Superstar buffer Aidan! If you look in the window, you can see the reflection of PRIVACY, as the job was done at Old Port Cove, Privacy's home port. We had the privilege of seeing the Piano Man himself's boat at the Palm Beach Show. Captain Gene politely declined a wash, but he could tell that we knew the boat, and we wanted to get aboard. After an evening working the Northop and Johnson tent (brokerage representing the sale of VENDETTA) on the last day of the show, Captain treated us to some drinks on the boat, and boy was it great to get aboard. The boat is a commuter, this style of boat was built for the social elite who found it far more fashionable to travel from home to work by sea than by land-- but who also justified this travel by making it quicker! These boats were sleek lines and big engines. Also, the interior was not for long distance cruising, and would have a very spartan layout. These boats were purpose built to go from Point A to Point B to Point A. A different, more comfortable boat would handle more luxurious cruising elsewhere. The designer of the boat is none other that "the Down-East Expert" (FMYC's term) himself.....*drumroll*..... DOUG ZURN! We take care of quite a few Zurn influenced boats, and you will recognize his styling even if you don't know its his. The Hinckley ____, the MJM's patented "parabola" window line, Marlow Yachts 65, Custom Builds for Lyman Morse, even the hull of the Vanquish runabout. take a look at Zurn Yachts to see his boats lined up next to each and other and notice the commonalities in his designs. In the early '90s, he worried about boating jobs on Long Island. "First there was the luxury tax and then the recession. I wanted to keep talented people working. I wanted to get involved. I didn't want the boatbuilders to lay off people." He teamed up with Doug Zurn and Peter Needham at Coecles Harbor Marine and, in 1996, introduced the 38-foot Shelter Island Runabout. So far, 39 have been sold (base price: $356,800). Suddenly, though not for the first time in his life, Joel had a hit on his hands. "We figured there might be a market for it, so we took it to the boat shows," Needham recalls. "The phone started ringing off the hook. We had to hire people, train them, and start a bona fide boat-building business." It helped that there was nothing quite like the runabout on the market, save perhaps for the wildly successful 36-foot Picnic Boat just introduced by Hinckley. It also helped that the stock market bubble was beginning to swell. A Microsoft executive flew in from Seattle and wanted a runabout immediately, Joel says. "He looks at my boat, and he goes, 'Whose boat is that?' I said, 'That's my boat.' And he goes, 'Well, are you in the boat business or not?' So I actually sold my original boat. But it was good for the company." Needham has just completed hull No. 36. Joel didn't invest in the business but owns the design and the tooling, and he collects a royalty on every runabout sold--the base price is $340,000. Needham says that another singing boat nut, Jimmy Buffett, nearly bought one. "He was 99% there. But at the last minute he said, 'I can't do this--it's like sitting on another man's throne.'" The black hullsides, wood cabinsides, and an off-white bridge really sets of the sloping lines, which to me gives it a "wind-tunnel" look, of the air breaking just aft of the cockpit. This profile is further accentuated when the boat is in motion, on a low plane angle, but with a frothy wake accepting the terminus coming over the boat, everything the boat is cutting through being churned and blown by right about where the transom is. Some notable tech on the boat are the hull made with SCRIMP technology, and the Power-Vent surface drives. SCRIMP which is much more common nowadays than it was in 2005, and is now commonly referred to as "vacuum bagging". To summarize the advantages of the system, you have a perfect resin/glass(cloth) ratio, taking out some of the soft spots found when laid up by hand. The Power-Vent system, is extremely impressive, and directs the exhaust under the boat to create a pseudo surface drive configuration. This accomplishes excellent performance, with less specialized parts, and a few side benefits such as no projection off the transom. Some of the surface drive boats (Magnum) will have MASSIVE achitecture coming off the transom, sometimes 6-8ft long! When a clean look and high speed is required, a configuration like this makes sense. Captain Gene was also discussing some other advantages with the power drive, as far as other engine intake/exhaust benefits which I cannot recall, but I do know the system was flexible enough to create some VENDETTA-specific advantages. Come Home Capabilities: Single engine on step running. Manual steering via tiller at any speed, even if console is destroyed. The helm is laid out in a form follows function manner, with 4 STIDD chairs in a military layout, 2 on the port, 2 on the left. Much like those darn Coast Guard boats always counting my life-jackets... This configuration makes sense for the purpose of commuting, and also allows a huge hatch down the the engine room. All deck in the helm is oiled teak, and the dash has every control you need, nothing more. The mechanical gauges are set in a single piece of stainless, alluding to a fast machine. Electronics are Raymarine 12"s, and an extra screen for the passenger in the port passenger seat to aid in navigation or plotting. Radar and Autopilot are included, but no FLIR or extra antennae that would disrupt the profile. The white exterior is repeated in the helm walls, and light wood accents for the forward bulkhead and ceiling. Heading down below, immediately to your port is a half galley, more for serving than preparation, with enough refrigeration for an extended trip. To starboard, table with two benches and seating for four is available for meals. Forward of the galley area, there is a bulkhead with a curving "Y" cut in it to allow a very open feeling, while still suggesting a solid structure. The other side of this bulkhead has center-facing seating for six, and a forward head makes use of that otherwise dead space. The cushions are a light green seafoam color, and the carpet and counter tops are both light neutral brown and gray. The engine room is unremarkable except for the size. Other bilges I had been in at the show were the MJM 36z With compact Volvos, and the Cruisers 47, I think with IPS 600's. HUGE difference in engine volume, for these engines to be put on a 50-60ft boat, you would expect the boat to be 20,000lbs heavier. I did a very poor job photographing the engine room and aft bilge that houses the Power-Vent tubes, guess I'll have to get more pictures next time I run into the boat. Another thing I would like to mention is how large the canoe stern is. It is big, a wide expanse of black, with the very ominous sounding "VENDETTA". This name by the way is not in reference to some long held grudge or rivalry against a fellow musician, but proudly suggesting that he wages a war with life. As often as it cold and cruel, he 'wins' by living well. I have no plans available, but I would venture that the beamiest part of the boat is 3-4ft from the stern, further stretching the tumblehome. Why the name Vendetta? I asked. "Because living well is the best revenge," he laughed. "I live in a Gatsby-type house, now I have a Gatsby-type boat. I enjoy that lifestyle." The little things I noticed (but would never think to photograph) were that the fixtures I saw were all of the highest quality. Things like the hardware for the engine hatch were definitely not something you can replace at West Marine, and all felt very solid. The cabin had lots of natural light, with both cabinside windows and hatches letting in a lot of light. The forward windows are just slivers, but justifies the slight rise in deck while drastically brightening the cabin. The mast, larger and exaggerated like that of a lobster boat, is the first thing a lot of people comment on, and I frankly think it fits well, and the boat would have a very different profile without it. Also, the boat was not 'flashy" at all, but rather modest. Nothing ornate, and the only real decorations were a few plaques from military organizations thanking Mr. Joel for his $upport. Thank you again to Captain Gene Pelland for the time, and check out our video of him skillfully taking the boat out of its corner slip, leaving the Palm Beach Show. You can also catch a few glimpses of the boat on our "horn blowing" video. Information about AUDACIOUS, Billy Joel's Expedition boat. If you want to pay $5 million more than build cost for a seven year old boat owned by a celebrity, this boat is for you.